An Albanian man has opened fire in an Italian courtroom, injuring his estranged wife and killing her uncle - before being killed himself by armed police.Three other people were wounded in the shoot-out during a divorce hearing in the northern Italian town of Reggio Emilia, near Bologna. Klirimi Fajzo, 40, managed to smuggle a handgun through tight security as he and his wife Vyosa, 37, attended the hearing. Witnesses said Fajzo began arguing violently with her relatives before shooting her and her uncle. The drama happened at just after 11am local time. Following the shoot-out a fleet of ambulances arrived at the scene to deal with the casualties. 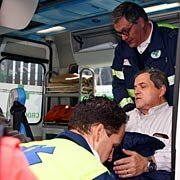 Fajzo managed to run out of the building and shot and wounded his wife's lawyer, Giovanna Fava, as well as another lawyer and a guard before being shot dead by armed police. Police said that the couple - who had two children - were originally from the Albanian port town of Durres but had lived in Italy for several years and were in the middle of separating. Paramedics rushed his wife to hospital while her uncle and the gunman were confirmed dead at the scene. Italian courtrooms are guarded by armed police and all people entering have to pass through a metal detector while bags are X-rayed to make sure no weapons or explosives are hidden inside. Court officials and police said that an investigation into how Fajzo had managed to smuggle the weapon into court without being detected was also under way. Hospital officials said that the three others hurt were only slightly injured.